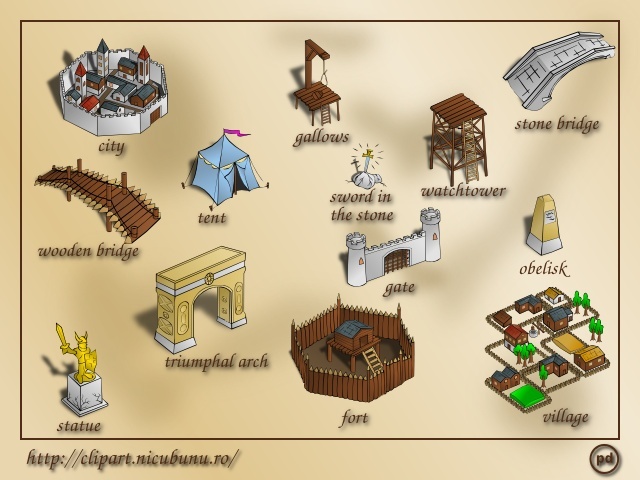 I can consider complete my quest for a RPG map tileset, 50 images are done (outline and full color), uploaded to my clipart collection and to the Open Clip Art Library (look at the cartography tag). Now is the time to sit back, relax, upload some samples in various places (like here), annoy people with that and maybe think at the next step, which should be something different. Or should I do more pieces for the set, considering I have a long list with additional ideas? This is a good think to think about while sitting back. I don't know how transparent is from those clipart images how much I miss the time when I used to fight orcs and be happy about that. I guess it's quite obvious (is a long time, about an year and a half). PS: the samples above are JPEGs, the PNG version was to big in file size, so I had to use lossy compression (with high quality), but load the JPEG, change the extension and will get either PNG and SVG. As always, this is brilliant work. One comment and one question. The question: what FOSS games can use this tileset currently? Any? Nice art! Have you considered contributing art to Wesnoth? They could always use more great art of this style. Thanks for the correction and thanks for paying attention (it shows you really liked it). As for what games... I didn't have any particular game in mind, this is why I made them as clipart and not as a contribution to a particular game. I wish I knew a FOSS game where they would fit... (I am a big fan of the "Heroes" series). 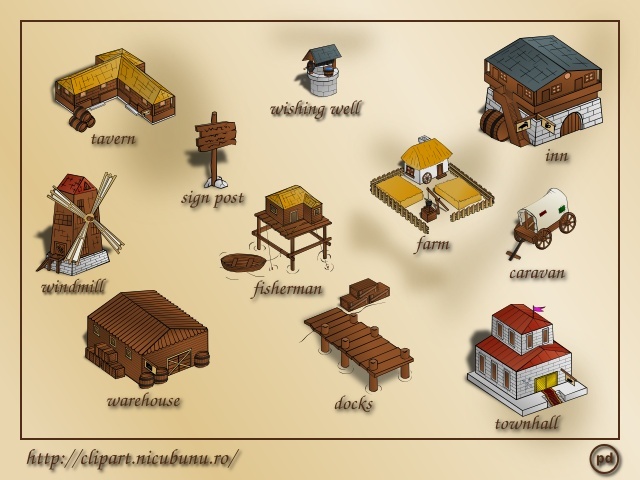 Wesnoth... they fit as a general theme (fantasy) but don't fit as particular style, Wesnoth use a pixelated style and my graphics are vector, another type of surface (the same is true for a lot of other games like Widelands and such). Back at Wesnoth, as I know it, the game does not need such a large variety of buildings, it have castles and villages and I believe this is all. I just wanted to say 'thanks' for the great map icons. I've added them all into my Fractal Mapper install, and it's made my mapping life a lot easier. 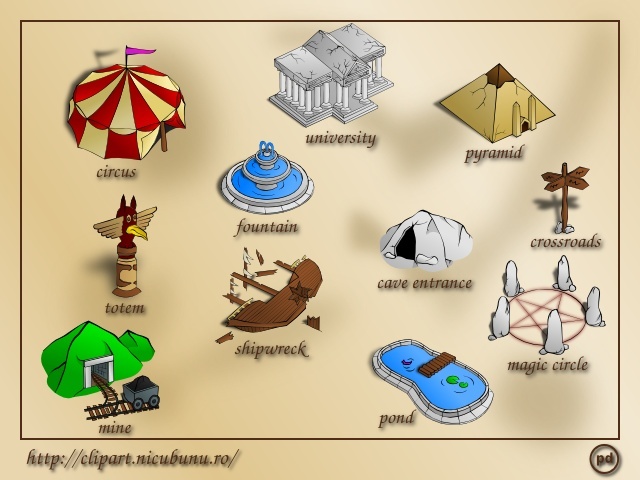 sorry, I meant to say "public domain clipart" not just "clipart"
@Andy Burns: WHAT???? The images are Public Domain because *I* published them so..., all of them are my *original* creation, what you see on clker.com are images taken in bulk from openclipart.org. I don't make any fuss for not being credited as the author on clker.com since the attribution is not required by Public Domain dedication, however, it would be nice and polite for them to do, or at least mention somewhere, anywhere, on the website: images from "openclipart.org".